All Shopify Orders that have not yet been sent to Fulfillment. Orders will appear here if they were placed when the “Auto Fulfill Orders” on the App’s Options is set to OFF. Orders here will expire after a period of 30 days if not submitted to Viralstyle for Fulfillment. All Shopify Orders that have been received by Viralstyle for Fulfillment. All orders here have not been billed yet and not in production. Most suitable period to make changes or cancel orders. All Shopify Orders that have been successfully invoiced/charged. All Shopify Orders that are currently in Production. No cancellations are possible when the orders have started printing. All Shopify Orders that have been cancelled and that have not been charged or have been refunded. All Shopify Orders that require a manual action or attention of the seller. This could include issues with the customers address, merchant payment method issues or invalid seller return address. You can also access this page by clicking the "?" on the top-right if your Orders Page, in-app (see below). 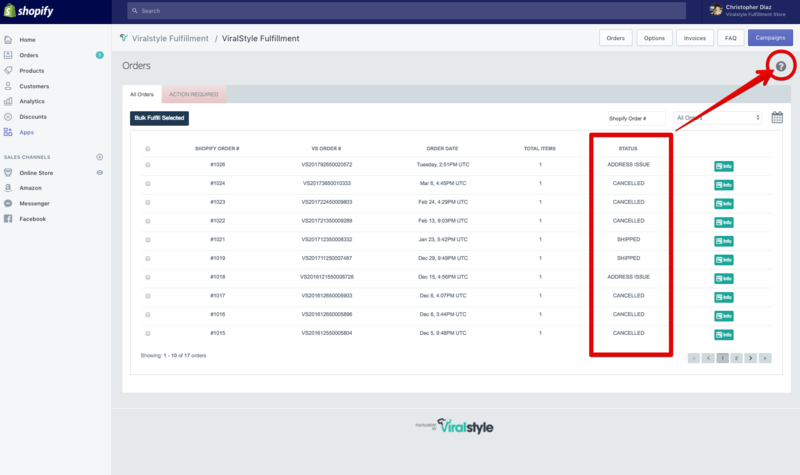 The Viralstyle fulfillment status seen above are not to be confused with the Shopify order status' and their meaning seen below. The fulfillment has been acknowledged by the service and is in processing. There was an error with the fulfillment request. Shopify gives you a very broad definition of fulfillment, where Viralstyle give you a detailed play-by-play. Although everything will sync & update automatically, it can get confusing at times. Learn more on this topic by visiting the Shopify Help Center.